where are the constant coefficients of a matrix . Recall that the eigenvalues and of are the roots of the quadratic equation and the corresponding eigenvectors solve the equation . 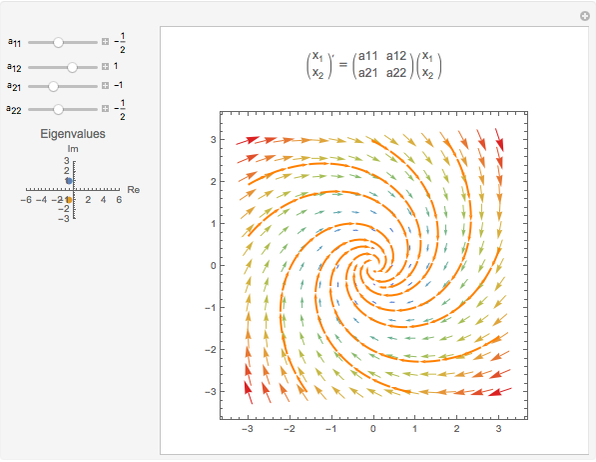 This Demonstration plots the system's direction field and phase portrait. In this example, you can adjust the constants in the equations to discover both real and complex solutions. The resulting solution will have the form and where are the eigenvalues of the systems and are the corresponding eigenvectors. Using Euler's formula , the solutions take the form . Since the Wronskian is never zero, it follows that and constitute a fundamental set of (real-valued) solutions to the system of equations. This is the complex eigenvalue example from , Section 3.4, Modeling with First Order Equations. Stephen Wilkerson "Using Eigenvalues to Solve a First-Order System of Two Coupled Differential Equations"